Walking Kerry’s historic trails amongst the highest peaks in the Emerald Isle. 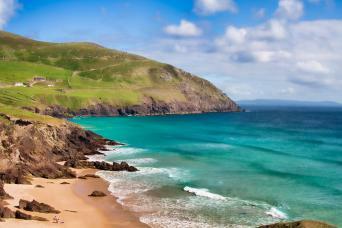 Soak up the atmosphere of County Kerry’s market villages and towns. 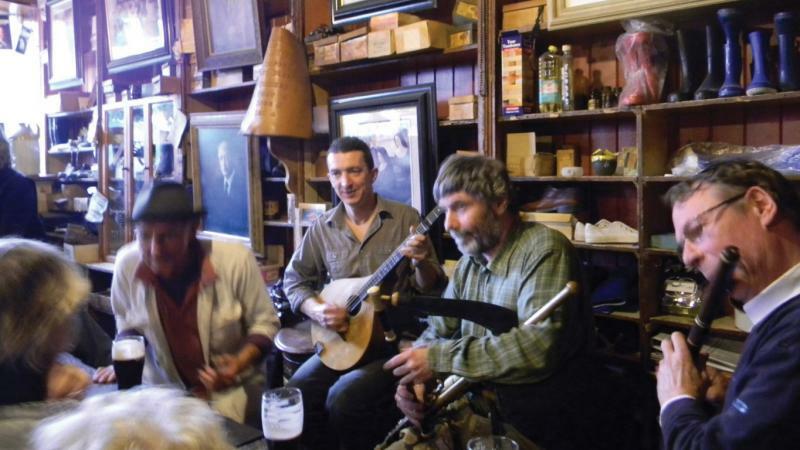 Lively Irish music and the ‘craic’ of authentic old-world pubs. The 2000 year old Staigue Fort is one of Ireland’s best examples of a ring fort. 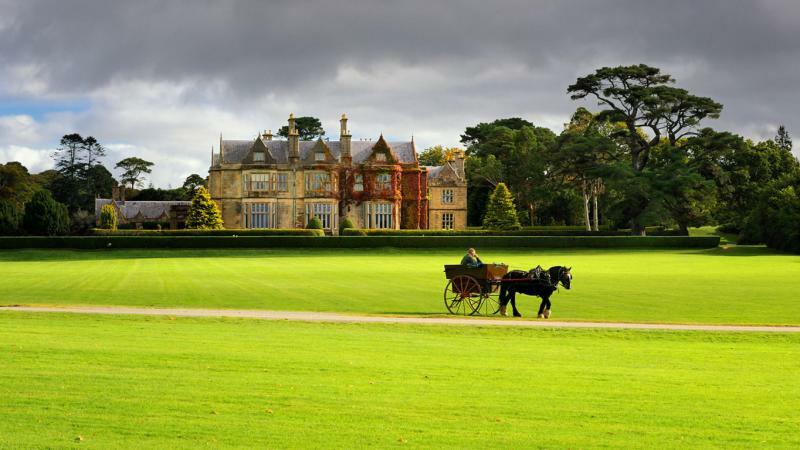 Majestic views of the Lakes of Killarney from the grounds of Muckross House. Your journey begins in the popular town of Killarney, from where the trail then resembles a loop tied by a stem to the town. Although County Kerry is home to the highest mountains in Ireland, the Kerry Way is largely a lower-level inland route along the lower slopes and around the Inveragh Peninsula with views to the wild Atlantic Ocean. Discover remote glens such as the Black Valley, and follow old green roads and historic tracks that have been travelled for hundreds of years. Enjoy warm Irish hospitality in delightful small market towns and villages such as Glenbeigh, Cahersiveen, Kenmare and Caherdaniel; the ancestral home of Ireland’s ‘Great Liberator’ Daniel O’Connor. County Kerry is steeped in ancient history and the Kerry Way takes you past Iron Age forts, Ogham stones and old monasteries. This classic national trail is a must for anyone who wishes to discover the real flavour of Ireland. Some images courtesy of/copyright Failte Ireland. The 210km of Ireland’s Kerry Way make it the Emerald Isle’s longest trail, offering a mix of mountains, lakes and superb coastal views. With friendly small towns along the route, it is possible to experience the Kerry Way on a short break, or take up to 12 days to enjoy the full walk. The lively ‘small’ town of Killarney is the official start of the Kerry Way. Relax into the Irish ‘craic’ at one of the many pubs or bars, or sample some of the country’s excellent seafood in one of the great restaurants you’ll find here. Head south from this popular tourist town, crossing the River Flesk, and walk a gravel road which you’ll share with horse-drawn jaunting cars! Skirt the edge of Castlelough Bay with wonderful views across Lough Leane to the Shehy Mountains as you hike towards the Victorian townhouse and gardens of Muckross House and then on to the foot of Torc waterfall. From time-to-time you’ll be following the famed Ring of Kerry road route, with impressive views across to the Purple Mountain, and MacGillycuddy’s Reeks beyond. Revel in the serenity of the wild moorland, oakwoods and lakes of Killarney National Park. Here you’ll also find Lord Brandon’s Cottage and a beautiful six-arch bridge which crosses the Gearhameen river, in the heart of Black Valley. Encounter some of the most rugged landscapes of the Emerald Isle. Ascend out of the Black Valley to find views of Bridia Valley ahead. Walkers will need to take care on a couple of steep and bouldery descents from the two passes on this section. Follow quiet tarmac and gravel roads, as well as paths through forest, and fields. Take in views to the wide Caragh River Valley and the range of hills beyond, dominated by the tilted triangular peak of Mulaghanattin (773m). Soon you’ll reach the shores of Lough Acoose, with views beyond to the Dingle Peninsula, western Reeks and Carrauntoohil, Ireland’s highest mountain (1,039m). Finally, you approach Glencar on the main road. Easy trails characterise this section as you follow first a ‘boreen’ (small road) then gravel forestry tracks to Lickeen Wood. Panoramic views to the wooded valley of Glencar and Lough Caragh enchant you as you round the hill and then ascend the gentle lower slopes of Seefin. You’ve a choice of (both delightful) paths to Glenbeigh; either descending on a more relaxed but longer approach (9km), or following a shorter rocky track to Glenbeigh (4km) ascending 100m to the saddle at Windy Gap, from where you will enjoy vistas over beautiful Inch Strand beach and the Dingle Peninsula. Glenbeigh is situated on the edge of the Atlantic Ocean and a great place to revel in traditional music and old- world pubs. The trail takes you out of Glenbeigh to cross the river Behy, over Rossbeigh Hill where you will have fantastic views looking out across the Dingle Bay and over to the Dingle Peninsula. The Kerry Way continues onto the slopes of Drung Hill to follow an old coach road passing Foilmore and into the Ferta valley, enjoying spectacular views to the wild Atlantic before arriving at Cahersiveen, principle town of the Skellig Kerry Peninsula. This section takes you inland along an undulating ridge that is covered in a blanket of heather and peat. Explore remote and rugged Irish landscape at its best, with first-class walks. 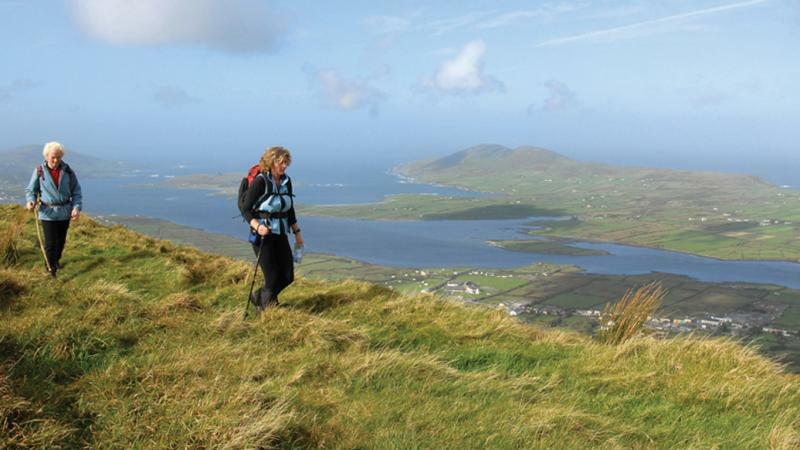 You’ll ascend the highest point of the Way’s coastal route, Knockavahaun, at 371m. A patchwork of forest and fields stretches out to Lough Currane. Ballinskelligs Bay and Waterville. Charlie Chaplin and his family used to spend long holiday periods here and a bronze statue stands on the promenade at Waterville. Choose between a shorter coastal route or a more challenging, longer inland path to Caherdaniel. 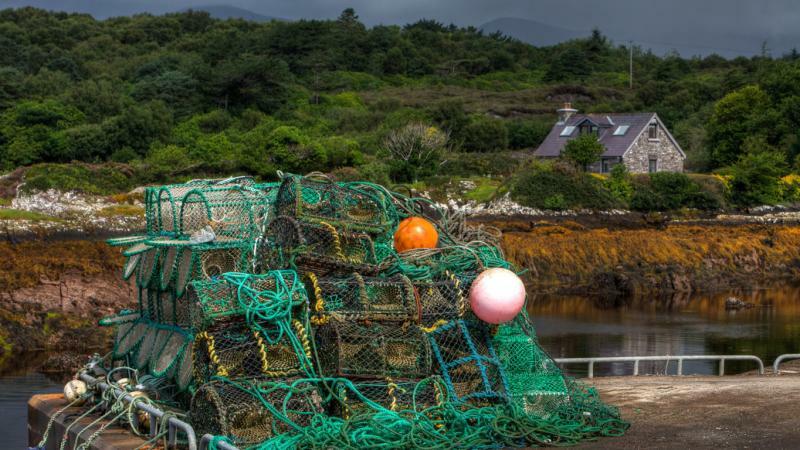 The shorter option takes a roadside path and minor roads, where you’ll enjoy constant views to the sea and inshore islets, as well as the Beara Peninsula hills across the Kenmare River estuary. Why not take a short detour to visit Derrynane House National Historic Park (visitors’ centre has seasonal opening), the ancestral home of Daniel O’Connell, Ireland’s ‘Great Liberator’. Descend through native hazel forest and see the Caherdaniel Stone Fort before arriving in the town itself. Ascent: approx. 330m. The longer, isolated and considerably tougher option passes through Windy Gap, on the shoulder of Eagles Hill and is wilder but exceptionally beautiful, with views over the sea, mountains and remote glens. Ascent: approx. 740m. Start with a walk along Ireland’s ‘Old Butter Road’, used in the 19th century to transport butter to Cork. Climb the lower slopes of Eagle Hill before revealing some lovely views across the inlet of Kenmare. Along the way you can take a short but busier detour to visit Staigue Fort, one of the largest ring forts to be found in Ireland. Walk an old coach road leading to a boreen as you trace the track above the main Ring of Kerry road, following rocky trails, approaching the picturesque village of Sneem, with its jagged and rocky river bed. This section of the Kerry Way is long but relatively easy with only minor rises and falls, with two scenic hill towards the end, of just 120m and 150m. This stage often touches the busier Ring of Kerry route and enjoys yet more fantastic views of the Beara Peninsula. Along the way you will pass Dromore Castle, built in the 1830s before the Irish famine, then pass by the ruins of Cappanacush Castle from the 13th century. After descending from Gortamullin Hil and crossing the Finnihy River into Kenmare you may like to walk to the ancient 4,000 year old Reenagoppul stone circle, situated just 0.5km outside of the town centre. Kenmare is a pretty market town with a host of great pubs and restaurants. This final stage of the Kerry Way takes you along the Old Kenmare Road and over passes between Strickeen and Inchimore and then Peakeen and Knockanaguish peaks. 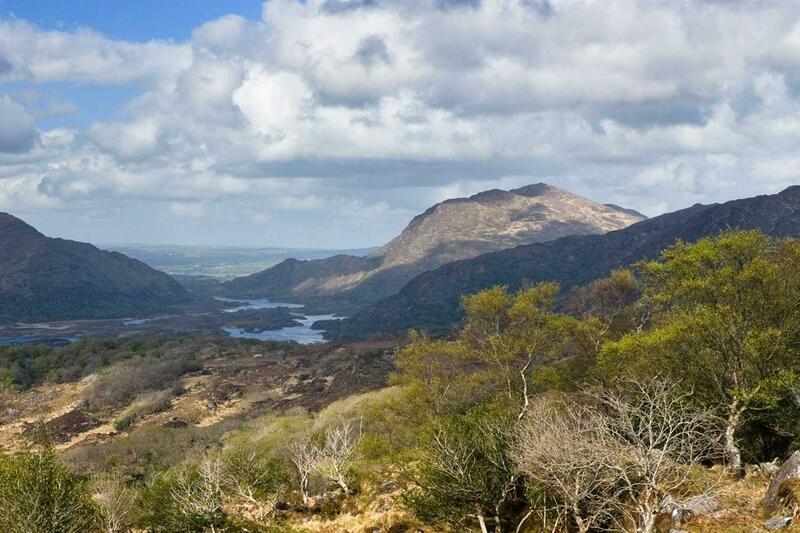 On this very scenic section hike through Killarney National Park and pass through old oak forests rich with lichens and home to native Irish deer. See the verdant moss-covered woodland surrounding the Torc waterfall and Muckross Estate. 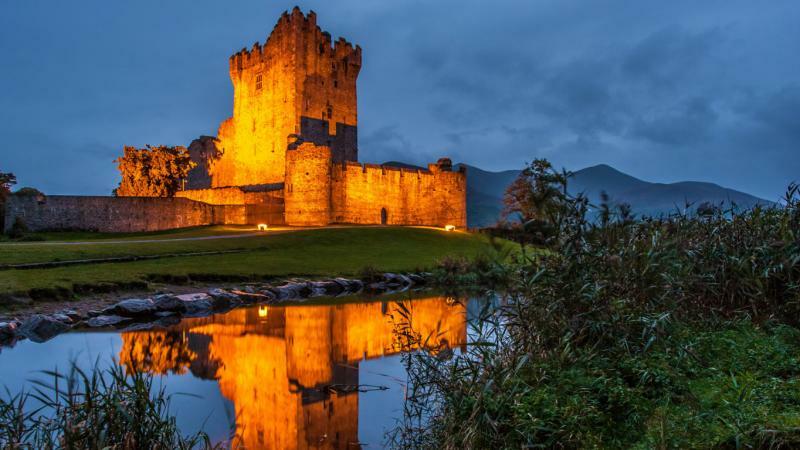 With views across the Killarney Lakes, you’ll soon find yourself back in the bustling small tourist town of Killarney itself, where you can raise a glass at one of the many pubs or bars to having completed the Kerry Way. One of the highlights of this tour is the high standard of the accommodation. We specifically choose the B&B’s, inns and guesthouses to ensure that you enjoy every minute of your stay. They all offer a warm welcome to walkers, traditional hospitality and delicious local food. Below are examples of the type of the welcoming bed and breakfast accommodation you can expect on this tour (all accommodations are subject to availability at the time of booking). We will always try and accommodate you at the locations detailed in the itinerary, but because of limited availability we may have to accommodate you at an alternative location. Alternative details will be noted on your accommodation sheet. Due the route taken by the Kerry Way, it is sometimes necessary to accommodate you a short walk away from the trail itself, as there is not always suitable accommodation close to the trail. Details will again be given on your accommodation sheet. A hearty breakfast is included each morning. Lunch and dinner are not included so you are free to choose from the available options. Most of your accommodations will more than happy to provide a packed lunch on request and this can be booked on arrival. Alternatively you can buy lunch at local shops or stop in a café. Dinner is available either at your accommodation or nearby pubs or restaurants. Maggie O’s is a luxurious bed and breakfast located in a quiet, and peaceful area just a five to seven minute stroll from Killarney town centre. Enjoy a atmosphere with contemporary and spacious en suite bedrooms with free WiFi, LCD flatscreen TV’s and king sized/super king beds. There is a guest lounge with satellite TV and an open fire. Hostess Margaret Casey and family are always available to help you organise trips, tours or visits to Killarney’s famous attractions. There is private off street parking or make use of the complimentary taxi from Killarney’s train or bus station. Taxi hire and bike hire available on premises. Hosts Robert and Mary Tangney welcome you to Hillcrest Farmhouse, a traditional homely farmhouse, scenically situated in the heart of Killarney's Lake and mountain area, with picturesque views of the McGillicuddy Reeks. All bedrooms are en suite with television, hairdryer and tea/coffee making facilities. Visitors can relax in the television lounge or enjoy watching the sheep and lambs grazing from their bedroom window. Dinner and packed lunches available upon request. Drying room for wet clothes and boots available. Blackstones House B&B is an old style award winning house scenically situated beside Blackstones Bridge on the Upper Caragh River. There are 6 en-suite bedrooms. All bedrooms are en suite with powered showers, tea/coffee making facilities, with satellite television, hairdryer and free WiFi. Each of the rooms are decorated to the highest of standards and are spacious. 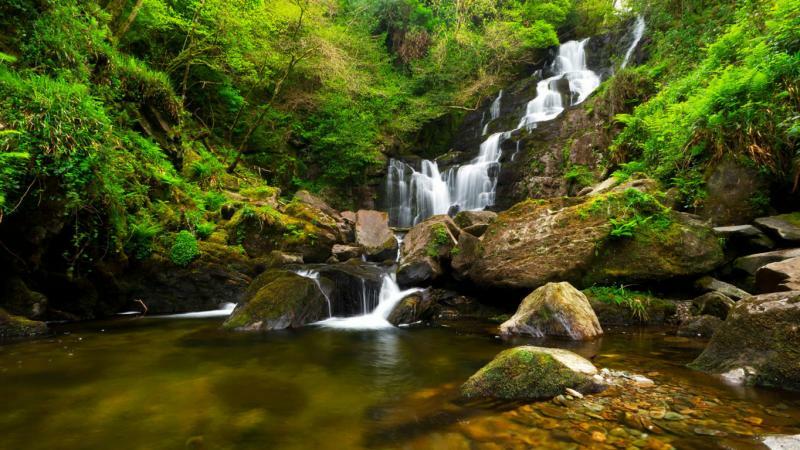 Each room has a panoramic view of the Caragh river, mountains (Carauntoohil – the highest mountain in Ireland and part of the McGillycuddy Reeks Mountain range) and woodlands (Licken Wood – excellent for walks), together with the soothing sound of the Blackstones Falls. Evening meals are served on advance request. Enjoy the hospitality of hosts Breda and Padraig Breen. Kerry Ocean Lodge is a 20-room luxury lodge providing B&B accommodation with fantastic views of 6-mile long Rossbeigh Beach and the Seefin Mountains. Guest bedrooms are bright and spacious, and have been tastefully decorated with pine floors and modern furnishings to ensure maximum comfort and relaxation. All rooms are en-suite, with TV, power shower, tea/ coffee making facilities and hairdryers. Strands End House is located at the foot of Cnoc Na dTobar mountain and is run by Joan and Eamonn Bowler. Eamon has deepened his knowledge of the environment, he loves to feed wild birds, he bakes traditional and contemporary specialties, and he intends to provide all his guests with a unique, memorable experience of Kerry Geo Park (the Iveragh Peninsula). This B&B is ideal for those who want to experience genuine hospitality. There is a free taxi service into town and use of the dining room for own meals is allowed. Fáilte Farmhouse is set on around 140 acres of sheep farm and bogland. It is the closest accommodation to the Kerry Way without taking the extra linking spur to Cahersiveen. Walkers will find a private sign-posted path through the farmland from the summit of Keelnagore, shortly after reaching Coars. All bedrooms are en suite with a shower. Evening meals and packed lunches can be provided with enough given notice. Alternatively a free lift to Cahersiveen can be arranged. Approaching the half-way point of the Kerry Way, walkers should be aware of the free laundry service offered at Fáilte Farmhouse. Guests can browse through a range of local interest books and mountaineering publications whilst enjoying a cup of tea or coffee in the dining room. There is a seating area in the garden in which to relax on warm evenings. Those who enjoy an open turf fire can visit the local bog to see how the turf is cut and stacked. Margaret Brown is your host at the charming Old Cable House Guesthouse in Waterville. A half way stopping point on world famous Ring of Kerry, this Milestone Heritage Site situated in Waterville Village traces its origins to the First Transatlantic Telegraph Cables laid from Ireland/Europe to USA in 1866. Free WiFi, tea/coffee making facilities in the room, and secure parking. Breakfast menu options include the traditional full Irish breakfast with black and white pudding, Brown’s cinnamon pancakes served with spiced apricots, or the poached fish of the morning. Dinner is also available for guests, with such delights as fresh Ballinskelligs Bay mussels or steamed Atlantic salmon in a herb beurre blanc. The Olde Forge has been serving breakfast to Kerry visitors for over 20 years! Cathy Fitzmaurice’s homely accommodation is located just 2km from the village of Caherdaniel. Rooms boast an unrivalled view over Kenmare bay to greet you in the morning. All rooms are en suite with shower and have tea/coffee making facilities and free WiFi. Hostess Helen Foley welcomes you to her bed and breakfast at Hillside Haven, located between Sneem and Kenmare with panoramic views overlooking the Kenmare Bay and Beara coastline. Coomassig View B&B is a luxury spacious dormer bungalow, situated less than half a km from the colourful little village of Sneem on the N70 Ring of Kerry. The comfortable and spacious double, twin and family rooms are all with en suite bathroom and satellite TV. Facilities include drying facilities for walkers and cyclists, private parking and lock up indoor storage for bicycles and back packs. The house backs onto the Kerry Way just outside Sneem and is perfectly situated for hikers. The 8 Guesthouse rooms are all en suite (private bathroom with power showers) and simply furnished and decorated, with hairdryers, personal safes, cable TV and very comfy beds. Some rooms have king size beds. Hostess Noreen delights in cooking up delicious breakfasts (orders are taken the night before), and host Neil is a wealth of local information. You can start this trip on any day of the week, between March and October. The Kerry Way is well way marked however you will also be supplied with the Rucksack Readers guidebook and detailed maps so you will have no problems following the route each day. This walk is graded moderate to strenuous (with the exception of the 5 days/4 nights option, which is graded ‘moderate’) and is suitable for regular walkers. It includes daily walks of around 20km (with more walks of around 30-33km on the 10 day/9 nights option), on varied terrain. Overall about 35% of the Kerry Way follows tarmac (bitumen) roads, which is less than most Irish national trails. This reflects the fact that rights of way are almost non-existent in Ireland. The road walking is scenic and mostly along quiet lanes, however there are from time to time some busier stretches where you will need to be cautious with traffic. The distances and ascent/descents are approximations of the recommended routes. Please be prepared by packing all necessary items, for example, proper rain gear (jackets and pants), sun hat and sunscreen. Your information pack has a detailed equipment list which includes standard walking/cycling gear such as good walking shoes or boots, warm and waterproof clothes for the cooler months and lightweight clothing for summer, and a day pack. Shannon Airport: Flights are available to Shannon Airport with Aer Lingus from Dublin, Bristol, Manchester, London Heathrow and Birmingham, as well as Boston and New York JFK. Ryanair fly to Shannon from Liverpool and London Stansted. Air Transat fly from Toronto and US Airways fly from Philadelphia to Shannon. From Shannon Airport take a bus (approx. 2h50-3h40, via Limerick) to Killarney. Dublin Airport is easily accessible from the UK with several low-cost airlines covering the route as well as scheduled international carriers. Irish Ferries also operate from Holyhead to Dublin. From Dublin Airport there is a good bus service into Dublin city centre. We strongly recommend taking out travel insurance to cover cancellation or curtailment of your trip. 9, 11 Nights bed and breakfast accommodation in en suite rooms wherever possible. A detailed info pack, route notes/guidebook and OSi maps. 24-7 Emergency telephone support from our office in the event of any issues. Single room or solo walker supplement (if applicable). Extra nights before, during and after your walk. Planning a trip on the Kerry Way can be daunting, especially if this is your first long distance walking holiday. We are often asked the following questions and we hope that you will find the answers useful. Please don’t hesitate to contact us should you have any additional questions. At up to 33km a day for the more strenuous tour, and up to a total of around 210km for the complete circuit, the Kerry Way is a fair distance and the higher your level of fitness the more you will enjoy the experience. Most of our itineraries involve an average of around 5-6 hours of walking daily so you should be comfortable walking on good tracks and paths over undulating terrain. If you currently don’t enjoy that level of fitness regular walking in hilly terrain supplemented by cardio-vascular exercise for at least 6 months prior to your walk is recommended. A good gym or personal trainer will be able to draw up a personalised training programme. 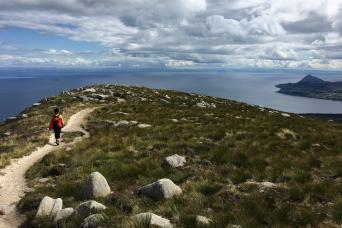 Our itineraries are mostly graded moderate and are suitable for regular walkers. You'll be walking along green roads, historic old roads, farm and forest tracks, paths across moorland and fields and minor roads. It is generally a low-level (albeit undulating) walk, interspersed with several ridge and spur crossings of between 200-300m. The highest point of the route is the summit of Knockavahaun at 371m.Overall about 35% of the Kerry Way follows tarmac (bitumen) roads, which is less than most Irish national trails. This reflects the fact that rights of way are almost non-existent in Ireland. The road walking is scenic and mostly along quiet lanes, however there are from time to time some busier stretches where you will need to be cautious with traffic. We suggest you book as soon as your plans are finalised as the Kerry Way is extremely popular especially over April/May and July/August. You will find up to date availability on our website and we will always try and accommodate your plans. You will need good walking shoes/boots (ideally waterproof), comfortable walking clothes, waterproof jacket and trousers, a daypack and hats/gloves etc. Our info packs have a list of all equipment to bring on your walk. Traditionally April through to August is a very pleasant time of year to walk. What about finding my way/navigation? This route is well way-marked and much of it does follows a path. It is always advisable that you are know how to navigate with a map and compass although the Way is largely very straightforward to follow, especially with the maps and guidebook we provide. The trip had great challenges, mostly weather related but being prepared to dress and undress quickly was a plus. The B&B's were great, the highlight was dinner at the Stepping Stone, John was fabulous` Instructions were perfect. We are planning for the next already. Macs is the best in the trek planning business! Caroline Sloan has consistently provided exceptional customer service, going out of her way to accommodate special requests. I enjoyed the Kerry Way a lot and would love to do it again. The best part of Kerry Way is the mountain view, ups and down of ridges, beautiful view of mountains, lakes and seaside view. Guest houses and accommodations were excellent along the way, but sometime, it's a bit off trail and took a long walk back to the road. Signs on the trail to accommodations were not there, makes it difficult to walk back to the B&B on the road. i.e. the Hillside Haven near Blackwater Bridge. The sign to the B&B was not on the trail, when we got to the Blackwater Bridge, and realized we passed it by 4 Km. It's disappointing that we miss it. This is a fantastic walk. I must quickly say that I didn't finish my walk, quitting in Sneem....not MACS fault. The supplied materials were excellent, downloading all the segments for off-line use on my IPad is a wonderful innovation and the accommodations were outstanding. I just plain, flat screwed up! After leaving Killarney, walking past the Torq waterfalls (beautiful) and instead of turning left (as instructed) to the Kenmare bypass, I somehow turned right and went right up Torq mountain to the top and then came down the other side ( so steep that there are ropes strung and the rock steps are about 2- 3 feet below each other) a local passed me and told me that no one goes down there because it is too steep. He also told me that I would have to go all the way around to the waterfall to get on the right trail. Results...33K day and Quads that never did recover. I tried but legs were wobbly and balance suffered for as much as I could do. First time I had to quit a walk but the challenge of the terrain and the legs left me no choice. Probably too much info but I want to say "if done right" the Kerry Way is a magnificent walk with absolutely the best scenery that I have ever experienced. Not to be missed by anyone who likes a challenge. For what it is worth, I have walked the Camino Santiago (Frances) twice, the Camino Primitivo and England coast to coast. This is the best.....been with MACS on most of them and will again. Just follow directions!!!! We had a lovely time walking part of the Kerry Way . Thank you for arranging the break. Great trip, great inns, great Ireland! Macs provides a suggested itinerary. I added the Gap of Dunloe. Superb accommodation and meals if required. We shared three fantastic traditional Irish meals as well as pub grub. Our bags magically appear each day at the next B&B. All these services are coordinated by one assigned rep at Macs who is an e-mail away. The owners of the various B&Bs are truly amazing. You want ride back from the pub or ride to the trail, no problem. Your only task each day is to find the next waymarker and enjoy the scenic vistas of the Kerry Way. Great walk, had a great time! Macs were very professional and helpfull when we organized our walk. All track notes and maps were accurate. Accommodation was all very good except for one of the six nights of our walk. 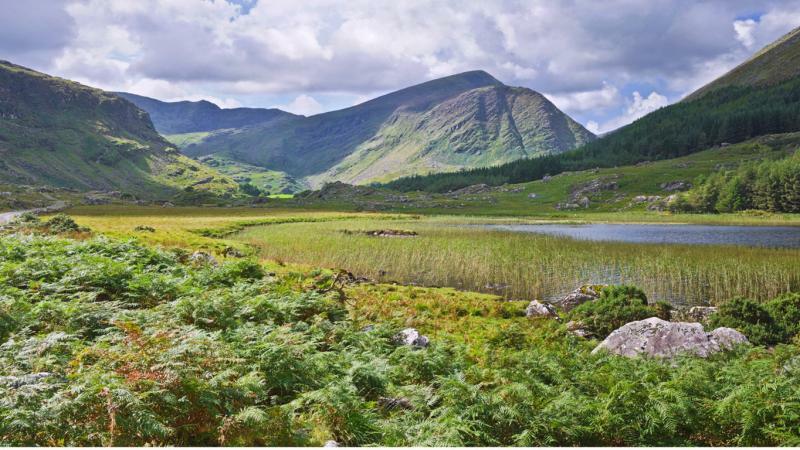 Ireland’s longest national trail is steeped in the rich history of the Emerald Isle and takes in stunning lakes, mountains and remote valleys, as well as superb walking with coastal views. 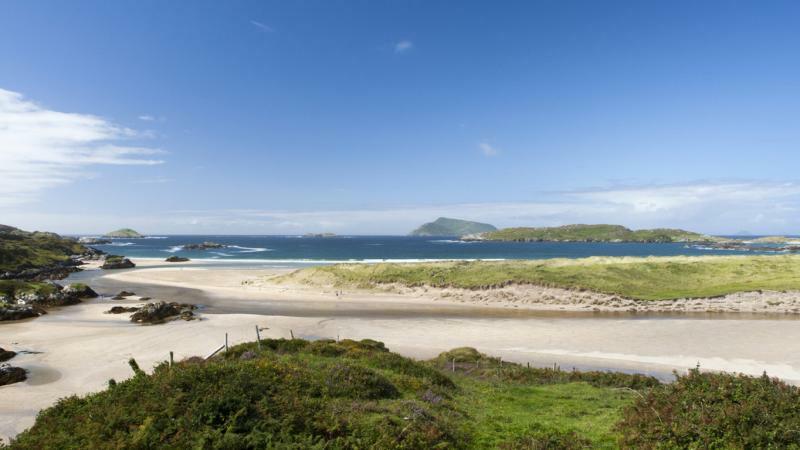 At times, you’ll follow the famed ‘Ring of Kerry’ route, taking life at a slower pace on foot.